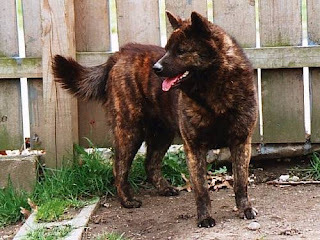 The Kai Ken is also called the Tora (Tiger) Dog, and it is debatable whether the breed's brindle coloring or fierce temperament contributed to this name. The Kai Ken was developed in Japan around the 1700s. The name comes from the ancient province in which it originated, and that today is in the prefecture of Yamanashi. Kai Ken were originally bred to hunt wild boar and deer in the mountainous country of the area, but are not commonly used in this capacity in modern times. The breed was first seen in the US in 1951, but did not become established for some years after that first importation. They are still not common except in their native Japan. It was thought that the breed (along with many others) was declining in numbers after the influx of western breeds such as the Pointer and the German Shepherd after the First World War. In the 1930s, a study done by Mr Harao Isogai attempted to categorize and revive the native Japanese breed, and they are at no risk of extinction today. The Kai Ken is a medium-sized breed of undeniably Japanese type. Height: 18 - 23 in (46 - 58 cm). Weight: 35 - 45 lb (16 - 21 kg), although some are said to grow as large as 60 lb (27 kg). The head is large (but not as large as some other Japanese breeds) with a rounded skull and moderately long muzzle that tapers. The forward-facing upright ears are triangular and sit on top of the head; they are not large, but are larger than those of other medium-sized Japanese breeds. The neck is short, thick-set and muscular, and the chest is also large. The tail is thick and is set high on the back to reach forwards and over to one side in a single curl. The Kai Ken has a harsh, straight outer coat, but the undercoat is soft and thick. They are always brindle in shades of red or black. The pups are born black and lighten as they age. The Kai Ken is a dog for the real enthusiast. Although it is no longer used for its traditional role of hunting wild boar, this dog retains many of its original attributes. This is a proud, noble-spirited dog of quite remarkable intelligence. It is suitable for the more assertive owner who is prepared to maintain a strict control over the dog, particularly when it is young. The Kai Ken can make a good watch-dog and it should only be encouraged to bark at the sounds you want it to respond to.